Later in this guide, I will cover what are the best stats, runes, monsters, and teams for ToA and ToAH. 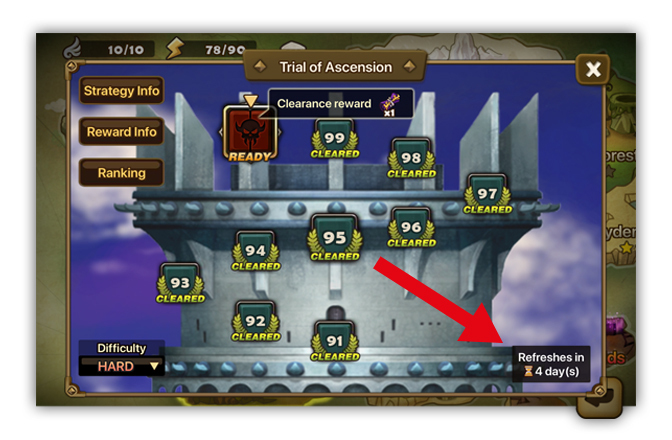 Both difficulties of Trial of Ascension reset once per month, make sure you clear all the stages you’re able to before each reset day. 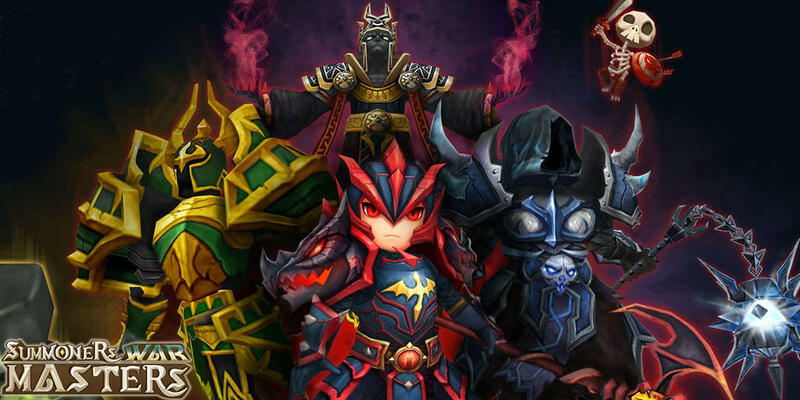 Here are some common terms used in Summoners War you should learn before reading this guide. Each stage in ToA has 3 waves of monsters with some stages having a boss on the last wave. Some stages can be quite difficult to clear and will require specific monsters to beat—especially boss stages. The main strategy for ToA is to pair Crowd Control (CC) with Damage Over Time (DoTs) to stop your team from dying while slowly killing the waves of enemies. The reason you don’t want to go for the standard defense break and normal damage strategy is because monsters in ToA have extremely high HP and Damage. Their high HP makes DoTs very effective because they do -5% of enemy max HP every turn they take. Crowd Control is also a must because if more than a few enemies get a turn at once they’ll for sure kill one of your monsters. These are the monsters you will use in your early game ToA team. Most of them are monsters from your GB10 team since you will have your best runes on them. These monsters are also great if you're looking for free-to-play (F2P) ToA monsters since they are all farmable. Puts 2 stacks of AoE DoTs with his third skill. Resets ATB back to 0 with second skill (Great for CC on bosses because they can’t be stunned). Can AoE stun with despair runes. 60% chance to AoE stun with his second skill. 75% chance to put a DoT on a single target with his first skill. AoE Cleanse your team every turn in case they get debuffed. Smart heal that will only be used when your monsters are low on HP. Her heal will also boost your teams attack bar making it easier to keep the enemies CCed. Defense break is also a minor benefit on boss stages to take them down faster since they are immune to DoTs. Increases ally ATB which makes it easier to keep the enemies CCed. Gives your team speed buff to make it easier to keep the enemies CCed. Can defense break and attack break which can be a minor help on boss stages. AoE attack speed slow debuff which is a great form of CC when combined with stuns and ATB reduction. Defense buff can help your team survive a few hits from any enemies that resist your CC. These monsters are great for safely clearing ToA in auto mode. Second skill does 18% of the enemies max HP as damage which is huge in ToA with all the enemies having crazy high HP. 50% chance to AoE reduce enemies ATB by 30% and 100% chance to put up attack speed slow debuff with his third skill that’s only on a 3 turn cooldown. AoE Increases skill cooldown time of all enemies while putting up attack speed slow debuff. AoE Reduces the cooldown time of your team’s skills while giving your team attack speed buff. Single target buff strip with a stun or defense break. One of the best healers in Summoners War because she has 2 strong heals. Second skill is a strong AoE heal. Her 3rd skill is a HP balance that can fully heal one of your monsters even through heal block debuff. 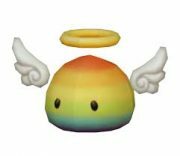 ATB boost may be the only thing he brings to the table but it gives you an incredible amount of turns allowing the rest of your team to effectively CC the enemies. Puts up 2 stacks of AoE DoTs on a 3 turn cooldown. AoE stun on all enemies that have DoTs on them. Having 2 AoE abilities will allow him to AoE stun a lot with despair runes. Single target attack speed slow + freeze. 2 Chances to AoE decrease enemy ATB by 30% with 30% chance each. First skill will put ATK break and Glancing hit debuff on bosses as a minor benefit. 50% chance to AoE decrease enemies attack speed or stun the target if they already have attack speed slow debuff on them. Third skill stuns the enemy with the highest ATB. Best reviver for a ToA auto team, especially when paired with Chasun. AoE attack break debuff is great incase the enemies get a turn. First skill puts up heal block debuff which is needed for some niche stages. AoE attack break and buff block which can be great on stages where enemies buff up a lot. King of CC and ToA, the enemies will be unlikely able to take a turn. Second skill has an 80% chance to AoE freeze. Third skill has a 100% chance to AoE freeze and reset the enemies ATB to 0. Refreshes the cooldowns of one of your monsters allowing them to use their big CC or DoTs skill two turns in a row. Puts a single enemies cooldowns on max and AoE resets the ATB of enemies to 0 (Great for not allowing bosses to use their second and third skills while also CCing the side monsters). Third skill is pretty much a guaranteed full AoE stun which also gives Okeanos another turn right after so he can reduce his cooldowns faster. AoE silence for 1 turn is great for incase the enemies get a turn they will only be able to use their skill 1. Second skill does enemy max HP based damage (great since ToA monsters have super high max HP) and AoE attack breaks in case the enemies get a turn. AoE reduces attack bar by 50% x2 times if the enemy has attack speed slow debuff. Second skill has a 60% chance to AoE stun and attack speed slow. Third skill AoE decreases the enemies ATB by 30% x3 times. Having 2 AoE abilities will allow her to AoE stun a lot with despair runes. Third skill is an AoE 25% ATB absorb which is great for controlling enemies and getting more turns to lower her own cooldowns. Having 3 AoE abilities will allow her to AoE stun a lot with despair runes. Third skill does huge AoE enemy max HP damage and also AoE reduces the enemies ATB by 30% while reducing the targets ATB by 90%. She will make it so the enemies are completely locked down and can’t take a turn while also pumping out crazy damage with her twin sisters. Defense break on first skill, this is good on her because the type of team you use her with goes for max damage not DoT damage so you need defense break. She pulls Shaina into her attack which reduces Shaina’s cooldowns so she can use her AoE stun and ATB bar reduce skill more often. Second skill defense breaks, atk breaks, and heal blocks which is important for some boss stages. Her passive pulls Shaina into her attack which reduces Shaina’s cooldowns so she can use her AoE stun and ATB bar reduce skill more often. These monsters are great on most boss stages because they stop the boss from wreaking your team since bosses are immune to stuns and DoTs. Skill 1 has a 50% chance to stun. Skill 2 self-heals himself and provokes a single target which is needed on a lot of boss stages. Skill 3 Removes 1 harmful effect on all allies and reduces their cooldowns by 1 while also putting up attack speed buff. This skill makes it easy for your team to get their CC cooldowns back up. First skill attack speed debuff with an 80% chance. This is great for keeping speed debuff on bosses. Second skill puts up DoTs which is good for helping to kill side minions. Her passive makes every attack reduce the enemies ATB by 25-50%, this is great for keeping the boss from moving since every turn she can attack speed slow and push back the ATB of the boss. Provokes the enemy with an 80% chance, great for bosses but Mav is better because his is 100% chance. Heal with defense buff can save your team in case the enemies get a turn. AoE reduces enemy ATB by 35%. You can also use Basalt as a niche monster on the Akroma stages because you need a dark monster to tank Akroma. Basalt is great for that since hes tanky, heals, and puts up defense buff. These monsters are used to speed clear through the lower floors, while some of them can be used in specific teams to clear all the way to floor 100. Pretty good damage dealer so clearing stages fast because he does 30% increased damage for every debuff on the enemy. Make sure to have a defense breaker, ATK buff, and lots of DoTs. Great for speed clearing low floors because he AoE def breaks and ATK buffs your team. Similar to Galleon except he reduces the enemy ATB bar instead of ATK buffs. Increase ATB of your whole team by 50% and reduces your teams cooldown. Amazing for speed clearing the lower floors because he does huge AoE damage that doesn’t need defense break. Not only does huge AoE damage but it will stop annoying enemies that resurrect or heal. Great for speed clearing lower floors because she does huge AoE damage and will be able to use his AoE again if he kills one of the enemies. Great for clearing lower floors because she does huge AoE damage and can use her other AoE skill if she gets a kill. ATK buff and ATB boost if you’re not using Galleon on lower floors. Huge AoE max HP based damage. These monsters are used mainly on one or two specific floors because they provide a unique skill that is needed. Amazing for tanking stages with Ragdoll because he is a light monster with a passive that makes it so he doesn’t take more than 20% of his HP as damage per hit. Good healer for stages where you need heal block debuff like vs Halphas so he can’t heal and get his invincibility back. Good vs stages with a lot of passives because he puts up Oblivion which stops passives from working. Mainly used on the ToA 100 boss Lyrith because her incarnations can be Oblivioned. Good healer for Akroma stage because she also defense buffs which really helps your Dark tank survive. Here are a few decent team lineups you can think about using. If you really want to build the best team possible for your stage of the game I would recommend you check out our Ultimate Progression Guide. 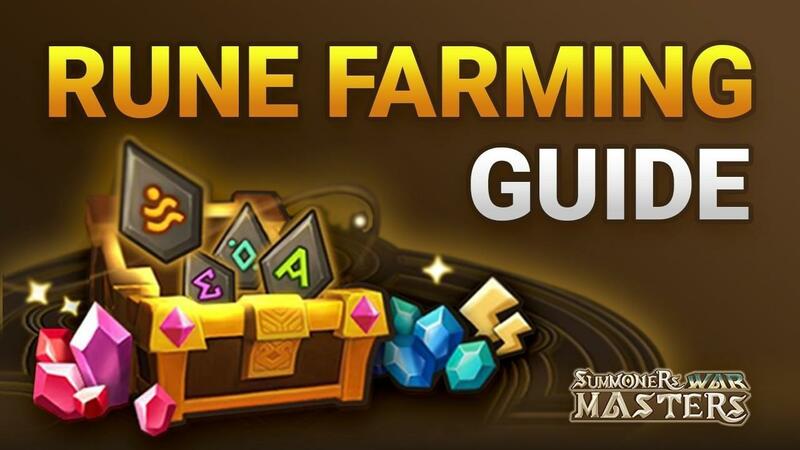 In there we go in-depth on what are the best teams to use for all stages of Summoners War, from super reliable early game auto teams to end game speed auto teams. These teams are great if you are still in the early game and only have limited access to monsters and runes. These teams are based around building a tanky team with a healer, DoTs, and moderate CC. These teams focus fully on permanently CCing the enemies while killing them with DoTs. For these to work you need a lot of stuns, freezes, and ATB boost or reduction. These teams are great for clearing the lower floors of ToAN and ToAH because they kill enemies fast but once your team starts dying you will have to which over to your standard or CC team. 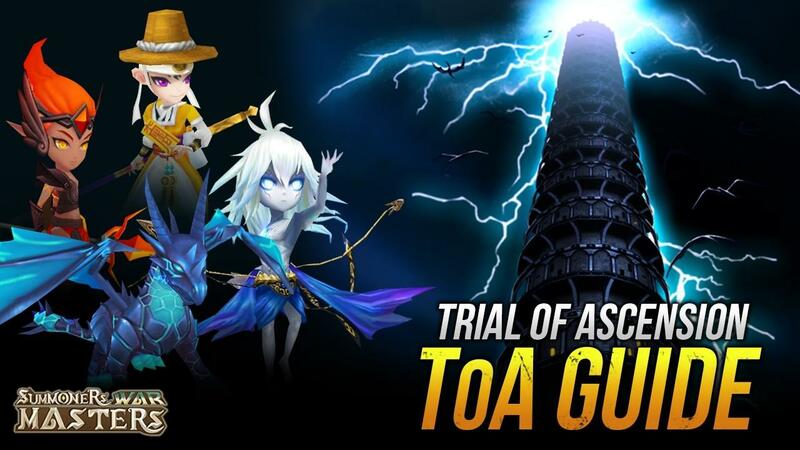 ToA is one of the best ways to get rewards in Summoners War. 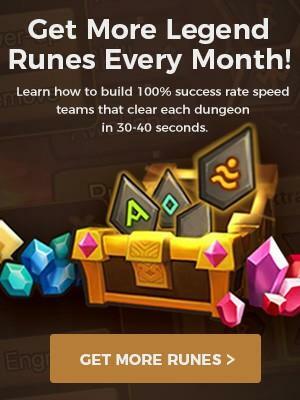 It gives you scrolls, crystals, rainbowmons, devilmons, and is the only way to farm L&D and Legendary scrolls. Being successful in ToA comes down too having tons of CC and using DoTs or the twins to kill the enemies. Some difficult floors will require you to build specific niche monsters or special team comps. Some hard boss floors will require having specific debuffs like slow and attack break or special abilities like attack bar reset and provoke. In the Ultimate Progression Guide, I cover 70+ more team comps, go in detail about how to build each monster, and provide a strategy guide for all the difficult stages and boss floors in the Trial of Ascension.